There are a variety of tuition payment options available (one payment, four payments or 10 payments). All payment plans are administered through FACTS Management Company and payments may be made by check, credit card, or automatic withdrawal. Wornick is committed to providing the highest quality education to its students regardless of financial capacity. We have a confidential tuition assistance process to ensure equitable distribution of available scholarships among the Wornick community. Tuition Assistance awards are based solely upon a family’s financial need. The Wornick Board of Trustees ensures that Tuition Assistance funds are available through donations and grants. In 2018-19, twenty-six percent of Wornick's budget is dedicated to tuition assistance funding. 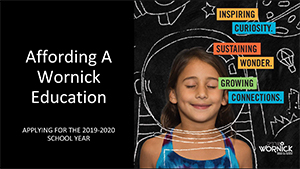 While most awards are made in the spring for the upcoming school year, Wornick also makes in-year grants to families with sudden economic needs. To learn more about our Tuition Assistance program, click here. Tuition assistance applications for the 2019-20 academic year are due on or before February 11, 2019. Please consult with your tax professional early in order to complete the application on time. Late applications will be considered after the initial pool of requests has been considered and funds have been allocated. To apply, click on the FAST logo which will take you to the website for Financial Aid for School Tuition.